Kitwe - Daniel van Tonder hadn't won in nearly five years until he pulled off a one-stroke victory on Sunday in the Zambia Open at Nkana Golf Club. 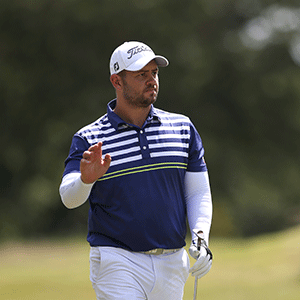 "It feels great," said Van Tonder. "I was close a few times last year. I’ve been up and down, and inconsistent here and there, but I changed balls and since then I've become more consistent." He birdied 12, but Mowat was always within striking distance and it wasn't until he birdied 16 that he felt he could breathe easy. "Once I got the final birdie on 16, I felt I could relax," he said. "On 17, I wanted to make a birdie to have a two-shot cushion. I knew 18 was driveable, but after seeing Mowat making par there, I knew I didn't have to go for the green." He put his approach just over the green into the fringe, and elected to putt from there. "That putt from off the green on 18 was straight into the grain," he said. "I felt I could chip it in but I knew I could make an easy two-putt and it would be fine." That decision was emblematic of the way his game has rounded out since his last win - and one of the reasons for that is the relationship with his caddie, wife Abigail. "My caddie lets me be aggressive like I want to be. There's no-one holding me back and she keeps me positive. "She said I should do what I felt like doing on 18," he said. "I felt like laying up, but before I hit it, I asked her if she though I needed to go for the green. She looked at me, but I laughed and said, 'Let's lay up!'" Through all that, it was his insistence on continuing to use driver on a course that was clearly punishing wayward tee shot severely throughout the week that eventually set him apart - and recalled the days of his early Sunshine Tour wins which came with freewheeling adventurousness. "I enjoy playing adventurous golf," he said. "I can hit the ball far if I want to, but this week I didn't need to. Shape a draw or fade, that's fine with me. I love the course here. It's tight and I love that. Not everyone is as accurate as I am with the driver so I take advantage of that." He was just relieved that taking advantage brought him his first win since June 2014. "I've been playing well for a while but it hasn't been showing in my scores, but finally, something came," he said.